I have successfully potty trained three kids in the last seven years, I know a thing or two about the process, so here is my take on choosing the right trainer for your child. The main issue is deciding if you should get a potty chair or toilet seat reducer, most often new parents would just buy either of the two without giving much thought to the benefit of one over the other. Seat reducers are generally meant for older kids (aged 3+), although some younger kids can commence their potty training with it, younger kids (below age of three) would do well with a chair. And they can easily transition as they grow older. Most parents prefer to train their kids with seat reducers because it’s less messy as compared to a potty, you don’t have to face the task of cleaning every now and then since the poo goes directly into the toilet and can be flushed out easily. 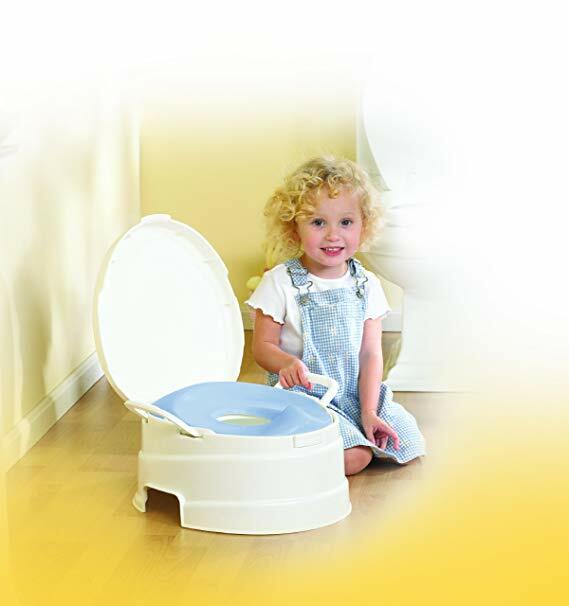 5 Potty Training Seat for Babies and Toddlers Toilet Use. Fits Perfectly: One of the important features to look out for is whether it fits perfectly well for your type of toilet or not. Some are either too small to fit or too big with the tendency of slipping off. This particular product fits perfectly. It comes with a little knob behind that let you adjust the seat to fit perfectly preventing cases of slipping. Comfortable Design: The design is highly comfortable to sit on, this is very important for kids going through potty training as they spend a considerable amount of time sitting on it especially when training for #2, it might take anything beyond five (5) minutes to get the job done. If it is not comfortable enough, they might find it hard to get used to it. This particular product is ergonomically designed to be as comfortable for them as much as possible. Splash Guard: Another common problem is pee getting splashed all over the place; especially when you have a baby boy. BabyBjorn tackles splashing by having a splash guard that is high enough to prevent the pee from splashing all over the place during #1. Easy To Clean: One of the benefits of using a reducer over a regular potty chair is the easy cleaning features that the former presents. This product is extremely easy to clean, and it does not harbor pee; which attracts germs like most other potty seats. It’s easy to remove from and clean. The mounting process is also very easy. Highly Portable: Very lightweight and can be fixed by kids as young as two (2) years of age. This makes it very easy to move it around. Potty training on the go becomes really easy as it fits perfectly into small bags. Making it easy for your baby to get the job done even when you’re far away from home. Perfect For Younger Baby: Elimination communication is a method of potty training kids at a very young age; some when they’re less than 12 months. 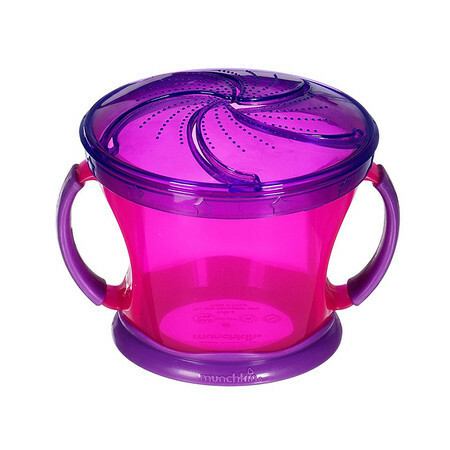 This potty trainer is perfect for parents that are looking into adopting the EC method. The opening of the seat is small enough to hold your baby’s bum without having to deal with the fear of them sinking into the toilet bowl. Sturdy: Most products are made of cheap materials that are not strong enough to accommodate the weight of the child. BabyBjorn is sturdily designed from strong plastic that can bear your baby’s weight. This does not only make it safer, it makes it durable as well. On the negative side; it would have been much better if the product has a handle on the side for the kids to hold on to while using the toilet. This is a secondary feature, and they would be absolutely fine without it. If what you need is a something that is easy to clean, fits perfectly and strong enough to support your child’s weight while they get the “business” done, then this is the product you want to buy. Cozy green is the second option to get if the BabyBjorn does not fit your requirements; either in the specification or in price. Just like the previously reviewed product; the cozy green trainer also fits perfectly. Although it does better on the elongated/oblong toilet, while it shifts a little bit when placed on the round seat. This wouldn’t be much of an issue if you have a slightly older child, from age of two (2) and beyond. They would be perfectly fine, either when used on a round or elongated seat. To make the trainer more stable, it has a ring; more like a grip on the bottom that is meant to prevent sliding. Sturdiness is important when making the decision. If the material is not strong enough, you run a risk of your child falling off, and when this happens, they usually end up with some sort of phobia for using the toilet. It is made of a strong plastic material, although the green part on the top of the trainer is made up of soft rubber to make it comfortable when kids sit down to get the business down. It’s also extremely easy to clean because it is easy to remove and fix back, cleaning becomes easy as compared to other types with different curves and contour that does not only store up pee and germ but also make the cleaning process hard. A very portable product that fits perfectly in a carry-on bag or diaper backpack bag. Most kids find it difficult to use the public toilet. Having one of these can encourage them to use other toilets since they will basically be using their seat reducer on the bowl; they don’t see much difference in it. As regards to being comfortable, the major difference this has over the BabyBjorn is the green part on the top. This green part of the trainer is made of rubber material that helps prevents baby from slipping off when using it. Although beneficial in keeping the baby “glued” to the seat; it might start to hurt if they seat on it for a long period of time. The splash guard on this particular product is not as tall as the previously reviewed product. For a baby boy, it is not perfect for preventing pee from escaping, this makes it much more perfect for girls. If you’re potty training a female child, then this is a product I will recommend over the BabyBjorn. The design is also very attractive, kids love colorful items, the green color might be their only reason for loving the potty. As a plus to the box also contains the potty chart, a suction cup for hanging after use and star stickers that is a helpful item when you’re just commencing potty training. The Primo 4 in 1 seat trainer can be used as a standalone potty chair, toilet seat reducer, step tool as well as travel potty. It’s a very versatile product; one moment it’s a potty chair, the next you’re using it as a seat reducer for adult toilet. Making it a very good trainer to buy if you’re not sure your baby would like a potty chair or would love to go straight to the water closet. It also makes the process of transitioning from potty chair to water closet relatively easy. This is a total game changer as compared to other products that have been reviewed so far; the concept of the design is to provide as much solution to the tools needed for potty training as possible. Truthfully, you can’t have all the basics covered and not expect lapses at some point or the other. As a standalone potty chair, the chair is sturdy; strong enough to support the child’s weight. It has a rubber pad underneath to maintain stability during usage. The height is appropriate for most kids and big enough for bigger kids as compared to other reviewed products. 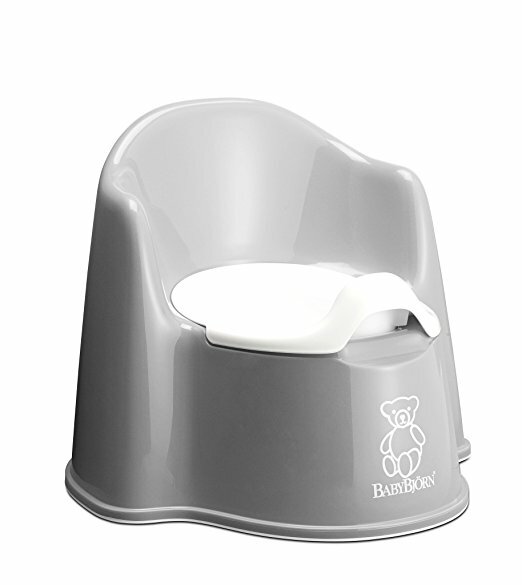 The lid that covers the potty chair when not in use can also serve as a backrest that prevents the child from falling back on the chair; although this is not what it’s meant for. 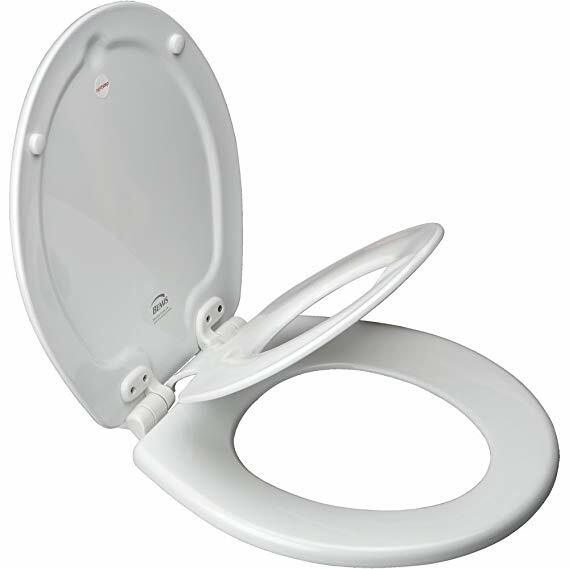 The removable part serves as seat reducer on water closet and it fits perfectly. It’s made of rubber making it comfortable to sit on. It has a handle on both sides, the handle makes it easy to remove from the main chair, and it also serves as a support when being used as seat reducer. The removable part doubles as the travel potty. It’s small enough to be carried along in a diaper bag. If you intend to step out and there are tendencies of your child using another toilet aside from the one he or she is used to; then carrying this along in your diaper bag provides a solution to that. The lid cover allows the toilet to be placed in the child’s room as it can be covered when not in use, so it does not really look out of place there. On the negative side; the whole seat trainer is a bit difficult to clean because it has too many different parts. The base of the chair does not fit perfectly with the removable part. With the numerous part comes the tendency of accumulating urines. So it takes extra effort to ensure that every part is well cleaned after use. It’s a good seat if perhaps you can train your baby boy to point his thing down there, if they can learn this, then you can easily use it for both boys and girls. The design is meant to instill confidence in kids to use the restroom all by themselves, nothing beat that. And it does a pretty good job as far as confidence and willingness is concerned. It fits better on standard size seats without shaking around. If you’re using on an elongated size, you would be better off placing it on the toilet seat and not the actual bowl. The seat itself is very comfortable, sturdy enough to support baby’s weight, with a soft cushion that doesn’t hurt the baby’s bum even when they sit on it for a while, the handle on the side of the ladder is an added bonus that makes the product safer for kids. Most products do not provide a place for kids to place their legs while using the toilet. 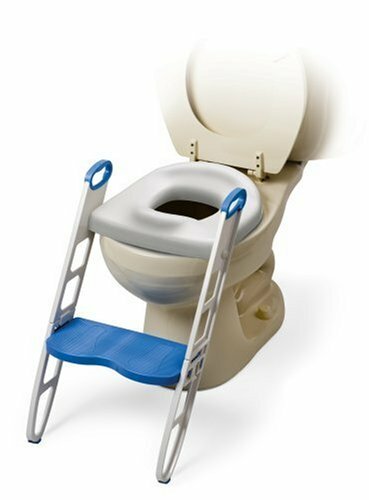 Mommy’s helper contoured cushier step up solves this issue via the ladder attached to the trainer making it super comfortable to use for kids. Even though it appears complicated, it’s easy to setup and clean. In less than 30 seconds you can put it on and remove it. The height is another issue that most people are concerned about; when properly placed, the trainer fits perfectly as far as height is concerned. Like all other product; using it for your baby right from the beginning of training takes the stage of transitioning from potty chair to water closet out of the equation. In rounding it up, the product is easily foldable, it doesn’t take up much space in your bathroom which might be an issue if you have small bathroom space. it can be easily packed when not in use without looking cumbersome on the floor. On the negative side; in addition to not having a pee guard, it does not have a clip or hooks to attach it. This explains while the seat might move about a little bit, but that does not affect anything once your baby is properly placed on the seat. If you have a much younger baby, you might want to ensure supervision for all toilet visits to avoid any form of accidents, especially on the ladder. #5. 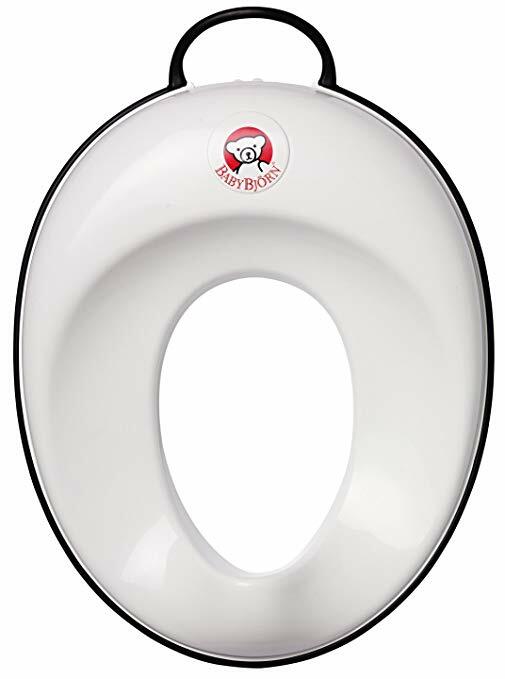 Bemis 1583 Slow Elongated Flip Toilet Potty Seat. If you want a toilet trainer that fits well with your Bemis, and the cost is not a factor, this is the best item to go for. This is my personal favorite; not because it is fancy or stronger than other, but simply because I don’t have to bother about putting the seat reducer on and off all the time. That alone makes the whole experience easier for me. The design is done in such a way that you have the small seat reducer attached to the lid with a magnet. More on that later. Installation: This trainer is attached to the toilet bowl, just like you would fix a new toilet seat. It’s that simple. Oh, and you don’t have to do it all the time; once you do it once, the only time you might want to unfix it is when your kid is older and you don’t see a need for it anymore; even at that, you can still keep it there because it does not interfere with the regular adult toilet seat. Slow Close: There is nothing as beautiful as having a toilet that does not announce it’s usage to the world. The slow close feature is something you would really appreciate if you have kids around; know that they love slamming things. Since it doesn’t make any sound, they would desist from slamming it against the bowl. When not in use, the smaller part has a magnetic system that attaches it to the lid of the bigger bowl making it seem as if it was never there. It is made of wood, making it super sturdy for use. It’s also very easy to clean, you can easily flip the small part and clean everywhere. You don’t have to separate anything for washing. Most of the potty seat reviewed so far in this post has one lapses or the other; some of them are minor while others are huge enough not to buy the product. As far as I can tell, this product is close to perfection. The only negative side that can be attributed to it is the lack of potty stool that can be used to climb or place the foot on when using it. If there is any product that makes the idea of the independent use of toilet appealing to both parent and toddler alike; this is the product. Previous ArticleBest Diaper Bags Backpack (Small, Large & Convertible) 2018.